Charge Shot!!! : Bad at Science: Particles, Teleportation and Aliens! Bad at Science: Particles, Teleportation and Aliens! I’m beginning to love science. I used to loathe it. I had a biology class that was way above my head in high school and I decided from then on that science was for people other than or smarter than me. How foolish! I still don’t get very much of what’s going on in the scientific community, but I’ve begun watching Carl Sagan’s Cosmos: A Personal Voyage on Netflix (it’s on instant, why aren’t you watching it right now!?) and I’m hooked. I’ve got the companion book, I picked up an illustrated version of A Brief History of Time and I’m ready to learn. It has me thinking that I’ve been hating on science all my life for no good reason. If a teacher in my high school would have just popped an episode of Cosmos on in ninth grade, who knows what my life would be like now. I’m trying to understand the scientific world, and I know we’ve got smarter people doing it better on this site, but for now you’re stuck with me. And two big (or, interesting at least) science stories popped earlier this week, and I’m going to try and explain them with no knowledge of the scientific mechanics behind them. Sound good? 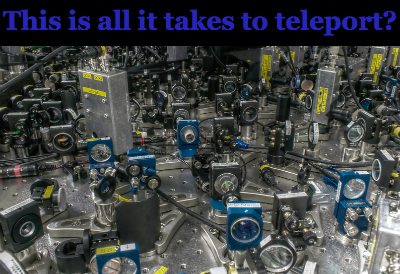 First, did you hear that scientists successfully teleported wave packets of light? I repeat: scientists have teleported something! Apparently scientists have, for the first time, teleported “a particular complex set of quantum information from one point to another.” This baffles and amazes me. I understand that the science behind it and the applications of the breakthrough point more toward information movement, but still! Basically, we’re not going to be sending anyone from point A to point B yet (that goes double for you, Jeff Goldblum), but we have used superposition* to send macroscopic beams of light from one point to another. It’s the first step in supercomputing and quantum computing, and it’s the kind of thing I would have never cared about before. Look at what I would have missed out on! The other article that jumped out at me this week had to do with aliens. And no, I’m not talking about Ancient Aliens like the guy with the crazy awesome hair. Apparently astronomers who search for signs of extraterrestrial life realized we may have been looking in all the wrong places! While astronomers were “scouring the galaxy for decades for alien-produced radio signals -- and more recently for non-naturally occurring light pulses, as well…” they should have been checking particles! They now believe that an advanced civilization could be trying to communicate by encoding neutrinos. Neutrinos are like electrons without a charge, so they can zip right through annoying things like gas, light and planets. The science behind this, like the science behind the teleportation story, is brain splitting, but basically they could be using particles to try and catch our attention. And the best part is we’ve been recording sources of these particles for over 100 years, but we’ve just been analyzing them in a way that would not have noticed any particle-play! Crazy! Could ET be spending billions and billions just to send out a little note saying “…sup?” Perhaps! I really enjoy reading about things like this. It is, in many ways, humbling. I consider myself well read and well versed in all types of (useless) things, but not hard science like this. It’s nice to read an article, get the gist, and then get my head blown off by the particulars. It makes me want to go out and read and learn and be a scientist! It reminds me that it’s okay to not know something. It’s okay to want to learn. *Fair warning: clicking on that link will unleash a torrent of math that will instantly shatter your feeble mind. I’m currently trying to remember how to breathe.